Since the introduction of Windows 8, I was aware that Microsoft had also rolled out an online subscription (pay) version of Office, but did not realize that there was also a scaled down free online version. I consider myself tech savvy and close to current on tech offerings, but somewhere along the line I guess I was sleeping - "free" and "Microsoft Office" all in one sentence? It's very possible that I read it and dismissed it outright as implausible. The irony of my discovery is that it was my transition to Linux that brought me to Microsoft office. "Huh?" you say. Yup, Linux brought me to the Microsoft online alter. My move to Linux caused me to revisit the selection of my primary word processor application. While running Windows this was a no-brainer. I have a licensed copy of Microsoft Office so that was an easy choice. My Linux Mint 15 installation includes LibreOffice Writer which is a great option for free (and likely will be my primary editor). However, I don't think LibreOffice Writer is as good in picking up grammatical errors as Word. Additionally, I find the built in Thesaurus in Word to be very helpful when trying to word-smith a blog post. (Since initiating this quest to find my "go to" editor in Linux, I discovered that a Thesaurus can be installed into LibreOffice Writer and have done so. Why it is not installed by default is a mystery as I suspect most writers would find this tool useful). As my discovery of free Microsoft Office Online was largely in response to finding an editor to use in Linux, I have spent the most time in Word Online, but will also sketch some of my findings regarding Microsoft Office Online's other offerings. First, I will remark that the URL for Office online is easy to remember. All you need to do is type Office.com and you have it. One of the first things that users of current Office products (Office 2007 and forward) will find is that there is a very easy learning curve. The Office ribbon and much of the offerings will be very familiar to Office users. Undoubtedly, this is what Microsoft intended. 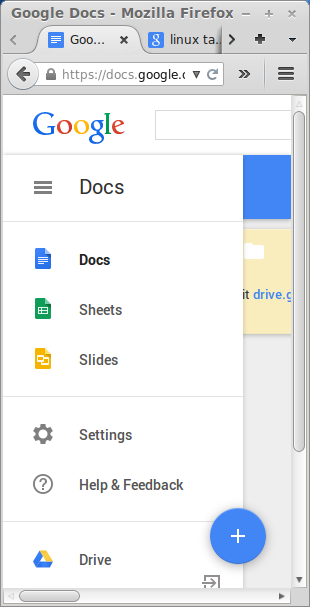 Users of Google Docs are likely familiar with the online storage and automatic saving of documents. It is a similar concept with Office Online whereby documents are stored within Microsoft's OneDrive and the free version provides a very generous 15 GB. One of the first annoying issues that I found was that I could not select and then right click to copy my selection to the clipboard. When I attempted, I was stopped by a message stating "Your browser does not allow access to the clipboard. Instead use the keyboard shortcuts for cut, copy and paste.” This was tested in Firefox, Chrome and Opera browsers with the same results. I suspect the underlying issue is related both to the browser and operating system (in my case, Linux) and that this may behave differently using Internet Explorer and Windows. Ultimately, I arrived at some show stopper issues while using Word Online. My first hint of trouble presented while testing using Opera and midway through a document, my cursor began jumping unpredictably to the next line and sometimes rearranging words in the process. At first I thought it was my computer and went through much consternation searching online for a solution and being steered to issues with the touch pad or touch stick. I tried disabling my touch stick and the problem continued. I then re-tried in Chrome and Firefox and was greeted with initial success. However, this success was not lasting and without rhyme or reason, the same phenomena arose with each of these browsers. This pointed me back to issues with my computer, but fortunately without too much time wasted I opened LibreWriter and pasted this posting and continued on without any issues which leads me to believe that the underlying issue is the pairing of Microsoft Office Online with Linux. The other show stopper that I encountered while using Office Online was a total computer freeze up. Once again, this happened twice while using Office Online and I have not (and had not) encountered this issue while using the computer on other sites or applications. I will briefly note that I was not able to find any similar issues posted online in regards to using Linux with Office Online. I suspect that this may be due to the relatively small number of Linux users and a much smaller number of Linux users who have spent time using Office Online. Prior to hitting the wall in Word Online, I did have an opportunity to tour some of Office Online's other offerings. Microsoft has done a nice job of integrating multiple applications whereby you can quickly switch from one to another. In particular, I can envision wanting jump from a document to an email to looking up something on your calendar and in Office Online this is easy to accomplish. In contrast, Google docs provides a quick menu to go to documents, spreadsheet or presentation applications, but I did not spot a quick way to get to email, contacts or calendar. I was able to easily add my Google contacts to the Microsoft Online Contacts. Adding my Google calendar to Microsoft Online was a bit trickier. I found general instructions online, but they were not specific enough for this user. For those interested, you can add your Google calendar to Office Online, by going to your Google calendar, hover your mouse over the name of your Calendar that appears under the heading of “My Calendars,” a drop down arrow will appear, click the arrow, then “Calendar setttings,” and then you want to go down to “Private Address” and select the ICAL button to get the URL which you will then copy and paste into Microsoft Online. (Silly me thought that XML was a universal type format and would be the one to pick; it isn't). In Microsoft Calendar, you enter the calendar, then click “Import” from the menu, then you will need to click “Subscribe” which appears as a choice along with “Import” on the left (“Import” is selected by default which can create confusion). After clicking “Subscribe” you simply paste the URL into the Calendar URL and then type whatever name you'd like for Calendar Name, then click “Subscribe”. I will remark that I do like the look of the Microsoft calendar. I took a very quick look at Online Excel. I was hopeful that there would be a template for a mortgage amortization (as there is in the desktop version via download). Unfortunately, I could not find this directly from Excel Online which is consistent with scaled down expectations for this free version. For those interested in this type of template, I did learn that you can search Google for Excel templates, then download the one you want to your computer and then upload it into Microsoft OneDrive. Then you can go to Office Online, OneDrive and double click your Excel template and it will open in Excel. It would be much nicer if you could just search for the template from Excel Online. One interested feature that isn't found on the desktop version of Excel is the ability to use a Survey template in Excel Online to create fields and then distribute to gather data from others. For my home use, I have little use for PowerPoint so I did not explore the Online offering. Office Online also offers an online offering for OneNote. In my home use when I was running Windows and Office from my laptop I would frequently use OneNote for the purpose of taking screen shots. This feature is not available through the online version. I have looked at OneNote at work and at home for other purposes, but have not found a compelling need for it so I did not take a hard look at OneNote Online. Great integration of multiple applications. Copy and paste is available through keyboard shortcuts only. Sadly, for this Linux user the show stoppers prevent Office Online from being a preferred resource.